Contradictory reports spread across the Web regarding the relocation of US nuclear weapons from Incirlik Airbase. Sputnik provides an overview of recent developments around the base. On Monday, the Stimson Center, a Washington DC-based nonprofit think tank, released a report, urging policymakers in the US to remove B61 nuclear bombs from Europe and strengthen conventional forces instead. Next day, on August 16th, Russian media outlet Izvestia cited Igor Morozov, a member of the Russia’s Federation Council (upper chamber of Russian parliament), former member of parliamentary committee on international affairs, saying: “It just remains to come to an agreement with Erdogan that we get the NATO base Incirlik as [our] primary airbase… You’ll see, the next base will be Incirlik.” This information has been published in The Times today, on August 20th. Later, on Thursday, August 18th, Sputnik reported information initially published by Brussels-based EurActiv news outlet saying that the US forces have started an operation of relocation of its nuclear weapons from Incirlik to Deveselu base in Romania. In about an hour since the initial report on Sputnik, Romanian Foreign Ministry officially denied that the country is going to host the US nuclear weapons in a letter to Russian RIA Novosti news agency. Later that day Sputnik attempted to contact the US Department of Defense, but its spokesman Adam Stump declined to either confirm or deny the information. Yesterday, on August 19th, Foreign Policy published an article, named “No, the the U.S. Is Not Moving Its Nukes From Turkey to Romania.” The article quotes a nuclear weapons expert Jeffrey Lewis, calling the information unlikely. According to Lewis, Romania lacks the required infrastructure needed to store the weapons safely. Unfortunately, Foreign Policy did not provide any official confirmation or denial for the message. On August 20th, World Bulletin published an article citing Amy Woolf, a researcher for nuclear weapons policy for the U.S. Congressional Research Service. According to Woolf, the nuclear weapons at Incirlik cannot be used, because they required a massive bomber that could drop them. On August 20th, the Prime Minister of Turkey Binali Yildirim said that Russia could possibly use country’s southern Incirlik Air Base if it becomes necessary. He also added that up to this point, Russia had no need for this base. 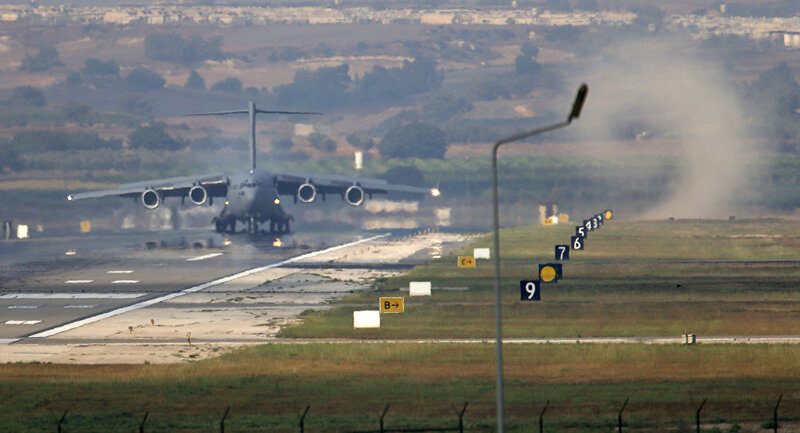 What’s really going on at Incirlik? While it’s clearly impossible to say for sure, there are some more publications on the Web that drop hints at what may be happening. While this is solely a personal opinion of a particular Turkish citizen, it is interesting in connection with another publication. On August 17th, a Turkish journalist Taha Dagli has published an analytic article at Haber7 media outlet. Russian InoSMI news agency has provided a translation of the article. According to Taha Dagli, the original report by Stimson Center implies that, should unrest and chaos spike in Turkey, the nuclear weapons at Incirlik may fall into hands of Turkey, Russia and Iran. These weapons could be reverse engineered and reproduced, Dagli says. Thus, Turkey or even Iran may get their own nuclear weapons, based on reverse-engineered American bombs. But why would Turkey aim to capture these bombs if it does not have a plane capable of delivering them? Dagli assumes that this could be used as an excuse for actions against Turkey, as it happened with the occupation of Iraq, which was justified by “fabricated nuclear weapons reports, saying ‘Iraq produces nuclear weapons'”, Dagli writes. Westerners find the journalist’s concerns to be without merit. The B61 bombs stored at Incirlik, have first been put on service in 1968. But since then they have been upgraded many times, the last time being in 2012, which make an arguably contemporary weapon. Sputnik will continue to monitor the developments around Incirlik. Georgi Gotev, the author of an article about the US transferring its nuclear weapons in Turkey to Romania, insists that the information obtained from his own sources can be trusted, and promised to follow up on this subject. “I’m sure that my sources are trustworthy, that’s why I wrote this article. I realize that the Romanian authorities are denying this. I knew they would as I contacted them before I published it. This is a secret matter, but I thought that my sources are reliable enough to justify the publication of this information,” Georgi Gotev, a journalist working with the news portal EurActiv.com, said in an interview with online newspaper Romania Libera.He said he planned a follow up story on this subject even though everything he writes about Romania invariably causes a scandal. Georgi said that after the transfer of US nuclear bombs from the Incirlik air base came against the background of worsening relations between Washington and Ankara. “After the recent failed coup Turkey is exiting the western camp and is turning towards Russia,” Gotev noted. “This is a tectonic movement that is bigger than a mere transfer of weapons, even nuclear. There is an extremely dynamic geopolitical context here. The Moscow-Ankara-Tehran axis now in the making would radically change the situation the region,” he emphasized. Earlier, the Brussels-based online paper EurActive.com reported citing its own sources, that the United States had started transferring its nuclear munitions in Turkey to the Derveselu air base in Romania. Romania dismissed the report as untrue. Another source told EurActiv.com that relations between Washington and Ankara had deteriorated so much since last month’s failed coup that the US no longer trusted Turkey to host nuclear weapons. “Before publishing this material I consulted with geopolitical guru George Friedman (the founder of the US independent research center Stratfor). He advised me not to publish this because no one in the know of the matter would say anything because, otherwise they could wind up in jail for 30 years,” Georgi said. According to one source, the transfer of nuclear weapons is a highly challenging process, both technically and politically. “It’s not easy to move 20+ nukes,” said the source, speaking on condition of anonymity. Are the U.S. and NATO on the road to Armageddon, making a fatal error in gambling that Russia and China are the same post- war devastated countries of half a century ago? Following the historic overthrow in the Bay of Pigs fiasco in 1961 (1,300 CIA trained and funded Cuban exiles) Castro was wary of another invasion attempt and invited Russian missiles into Cuba. Meanwhile, the US had installed nuclear missiles in both Turkey and Italy in 1961. Consequently, Russia saw this as an opportunity to place its own missiles in America’s backyard. The Pentagon urged a full-scale U.S. invasion of Cuba, backed by massive naval and air power. All Kennedy’s advisors, including Secretary of defence McNamara and Vice President Johnson, recommended an American invasion of Cuba, which would have guaranteed a nuclear war. Fortunately, Kennedy forbade the U.S. military to invade Cuba. Moreover, but unknown at the time, Soviet troops received authorisation to use 100 tactical nuclear weapons against any invading force and their bases in South Florida. With both sides set on a crash course, on the 26 October 1962, a personal letter to Kennedy arrived from Khrushchev with a deal. If America withdrew its missiles from Turkey and Italy and give a cast iron guarantee not to invade Cuba, Russia would turn its ships around and withdraw the missiles from Cuba. A compromise reached, Kennedy accepted and both sides saved face. Did the propaganda version of victory mislead America into the self-complacency seen today and an over reliance on military action to resolve its future political problems? “We were ready to do this … (Use of nuclear weapons against NATO) Crimea is our historical territory. Russian people live there. They were in danger. We cannot abandon them” – Putin, Crimea: The Road Back Home. Obama, a former Chicago political activist threatens Russia and China at the UN: “I lead the strongest military the world has ever known” – 70th session of the UN general assembly. The roots of America’s current belligerence lie in the private ownership of its currency, privatised by Woodrow Wilson in 1919, the now U.S. Federal Reserve. Like any privatised business, the Federal Reserve relies on a customer base, but as its customers dwindled, the future consequences forced America into protection racketeering, and manipulation to save its usury power. Today, this intervention translates to regime change and removing those who won’t agree. In other words, the U.S. produces dollars and the world peripheries produce to sell for those dollars, consequently, this means the U.S. has been living free by printing pieces of private profit-making paper for decades. In a world-wide economic recession, the world is finally beginning to realise the previous power of the U.S. lies not in exceptionalism, but in its parasitic nature. All this remains a conspiracy theory to many Americans, but well known to the rest of the world – Ron Paul explains. In November of 2000, Iraq began selling its oil only in Euros, the PetroEuro. In 2006, Libya’s Khadaffi organised a block of African countries to create a gold-based currency called the gold dinar, to replace the U.S. dollar. In 2007, Iran requests payments made in other than $US. Bound by common defence agreements Syria is Iran’s closest ally. Both China and Russia abandon the Petrodollar in 2014. In all, 23 countries have now abandoned the dollar and SWIFT, the dollar-based financial transaction system. In All Wars are Bankers’ wars! Michael Rivero explains the history and predatory nature behind the U.S. Federal Reserve. However, the site experiences regular takedowns, here for a .pdf version, or the video here. Required knowledge behind the turmoil in today’s world. While NATO and the US continue to play war games, those on the receiving end might want to play another game with nukemap. Enter your world location, select a missile, view the strike results and hope it remains a game. The bombs dropped on Nagasaki and Hiroshima were 20kt and 15kt respectively. The Russian Topol SS25 is 800kt! The world has changed since the Cuban crisis of over half a century ago. Today there are no winners, confidence cannot be high and only compromises remain. Or will America go quietly? A strong U.S. economy is not the answer to global prosperity; it is a system that allows the transfer of the world’s wealth to the U.S. As the global recession bites ever deeper, more and more Americans are waking up to the realisation that it was not they who created the wealth of America, but others. The dollar is collapsing and the American Empire is in decline. From The Federal Emergency Management Agency, to the militarisation of the police and what looks suspiciously like the beginnings of a police state, it is clear the U.S. government also realise the dangers ahead. 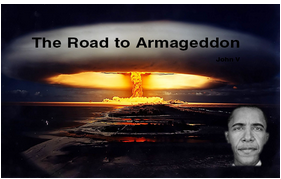 Will the U.S. go nuclear, or accept the unavoidable economic and social collapse on its way to Armageddon? Moscow will improve its nuclear arsenal development in response to NATO’s buildup in Eastern Europe, the Federation Council committee’s deputy chairman said Wednesday. Earlier in the day, NATO Secretary General Jens Stoltenberg said that NATO ministers of defense agreed to boost the alliance’s presence in its eastern part as well as in the Mediterranean and the Black Sea. “Russia will continue to strengthen its defensive potential, to improve the deterrent potential of nuclear weapons… We possess weapons that can deter our so-called partners from any critical decisions that could come to their minds,” Evgeny Serebrennikov told RIA Novosti. He added that NATO’s activities aim at deterrence against Russia both in economic and military spheres. Since 2014, NATO has been steadily building up its military presence in Europe, particularly in Eastern European countries bordering Russia, using Moscow’s alleged interference in Ukraine as a pretext for the move. In September, Kremlin spokesman Dmitry Peskov said that any NATO advancement toward Russian borders would prompt Moscow to take counter-measures to ensure the country’s national security. The Russian Foreign Ministry said that Russia believes that the United States violated their bilateral deal on intermediate-range nuclear forces when it installed Mk 41 vertical launching systems in Eastern Europe. Russia believes that the United States violated their bilateral deal on intermediate-range nuclear forces when it installed Mk 41 vertical launching systems in Eastern Europe, the Russian Foreign Ministry said Wednesday. The 1987 INF Treaty banned nuclear and conventional ground-based cruise and ballistic missiles with a range of 300 to 3,400 miles. “We have grounds to regard land-based Mk 41s as cruise missile launching systems and their deployment on the ground as a direct INF violation by the US side,” the Foreign Ministry said in a statement. When installed on warships, Mk 41s can be used for launching both SM-3 interceptor missiles and medium to range Tomahawk cruise missiles. Several Mk 41s are currently stationed in Romania and will be later redeployed to Poland. This came in response to continued US accusations that Moscow is not fulfilling its INF Treaty obligations. Washington alleges that Moscow tested a ground-launched cruise missile in violation of the INF Treaty.The Russian Foreign Ministry reiterated on Wednesday that Moscow considered such accusations to be baseless and accused Washington of using these claims to justify its “response” measures. US Undersecretary of Defense for Policy Brian McKeon said earlier today that the Pentagon was developing a “comprehensive response” to Russia’s alleged military actions irrespective of Moscow’s answer. “The aim of this deceptive move is obvious – it is to cast a shadow on our arms controls and to deflect attention from US actions,” the Russian statement read. It accused the United States of piling military infrastructure at the Russian border and refusing to discuss the problem. “The situation with the treaty is shamelessly used to escalate the atmosphere of chronic military tension across the Euro-Atlantic space,” the Ministry said. Speaking at the House Armed Services Committee, Brian McKeon said that the United States would increase its rotational forces and military exercises in NATO’s eastern flank, and preposition military hardware in Europe.